Today's inspiration comes from our friends at 'Three Dog BBQ. Bill and his wife Hope compete in BBQ contests around the Pennsylvania area. We may be twins because we sure like the same foods and pastimes. He recently made some baked beans with bacon, bourbon and peaches. Peaches are at their fragrant and juicy best and with the addition of bacon this bean pot was a no-brainer. We used Bill's recipe as a frame and threw in Chilebrown twists. Sit back, relax and let's stir the pot. Fresh peaches were bought straight from the farm at 'R & K' Corning, California. This farm is a must stop when traveling down interstate 5 from the north. It is always fun to make a connection to the actual farmer. It guarantees the best product and probably a couple of stories will be thrown in. Through my farmers market connections,we also procured some sweet onions called 'Candy' from a farmer in Yreka, California. Nueske bacon, dried beans and bourbon would complete this shopping list. The dried beans were covered with water in a cast iron pot. They were placed in a 350 degree oven. Today we are using an old friend the 'Smokenator 1000. The peaches, bacon and onions would take a one hour smoke sauna that was fueled by smoldering peach wood. After one hour the smoked ingredients were removed and chopped. The bacon was rendered in a cast iron pan to remove some fat. The chopped onions were added. Several minutes later the peaches were added with 2 ounces of bourbon. Stand back because this will ignite. Once the flames have subsided add all the ingredients to the bean pot in the oven. I also added some honey, bbq sauce, several chopped home grown tomato's, garlic, 1/4 cup of molasses and salt. Return to oven. Bake the beans until tender. I left the lid on for the first three hours. The last hour it was removed to thicken and reduce the liquid. 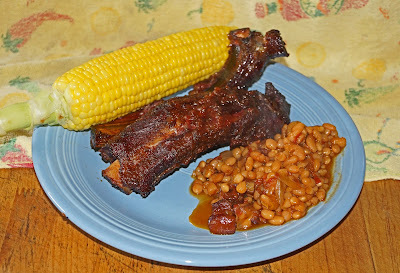 We served our beans with some smoked beef ribs. This bean pot was smoky and sweet with peach love. Ms. Goofy liked the little pieces of peach. The bourbon flavor was lost in the cooking. 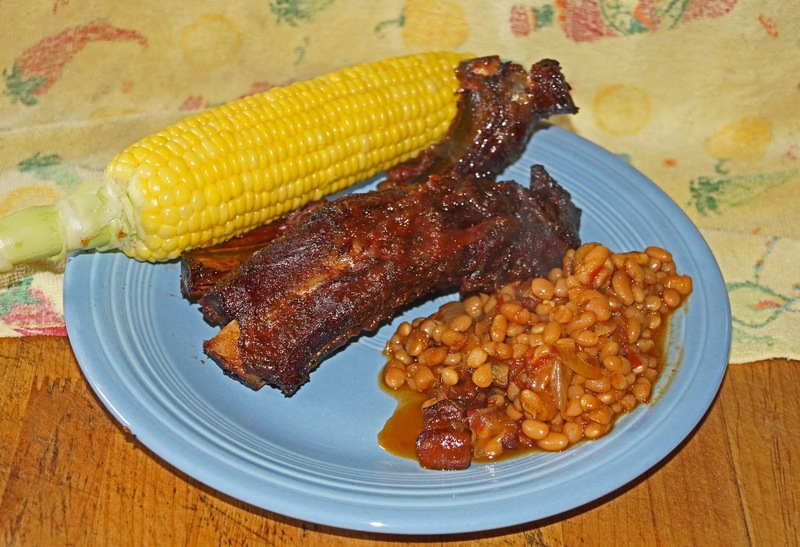 Smoky bacon and beans is a combination that cannot be beat. Peaches are a welcome addition to this pot. For the original recipe check out 'Three Dogs BBQ'. Chiliebrown, I like how you changed up the recipe. I will making these changes the next time around with this recipe. Three Dogs BBQ, Next time I might leave the bourbon out. It seemed like a waste of good swill. cookiecrumb, You have to be careful putting alcohol in the oven. My friend Bucky was making fruitcakes and the oven exploded from the alcohol fumes. Oh, jeeze! OK, use more. I love that you smoked with peach wood. 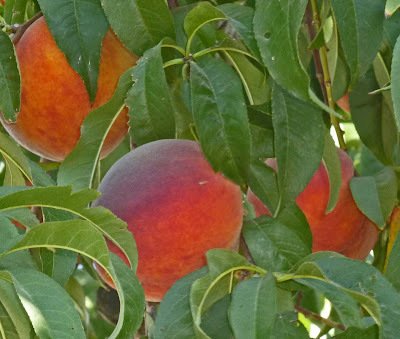 And since we're just starting to see Colorado Peaches in our markets, this caught my attention. 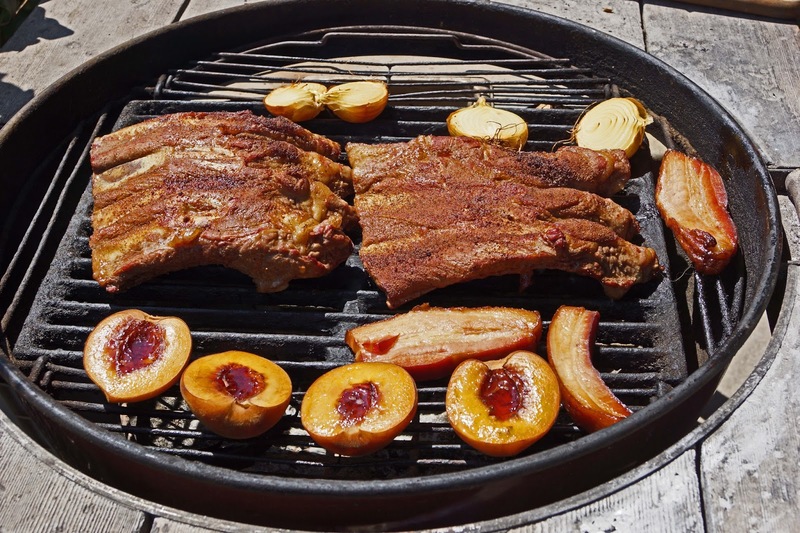 Even though I don't have a smoker, I most certainly could grill some peaches and give this a try. Lea Ann, What kind of grill do you have? You can smoke with almost any bbq. Smoker bags can be used in your oven but you better have a good fan. I would venture to say non-smoked peaches would still be good. Have fun.